Detailed attention is given to every aspect of your décor- so why not the lighting? Customized lighting is important for overall design, showcasing collectibles and flattering other furniture. With the variety of customized lighting and motorized window treatment options available today, light that complements your décor is easier than ever. Rich AV Design's professional integrators can construct your scenes of light in “layers” allowing you to assemble the perfect atmosphere with the touch of a button. A room of featured artwork can be put on display when a guest arrives, simply by engaging a “showcase” setting. Lighting control can help create a consistent design style throughout a home, replacing clusters of switches in various locations with simple control panels, set to pre-programmed scenes, such as “Morning!,” “Intimate,” and “Goodnight.” With dimmers and motorized shades throughout your home, natural light can also be included as a complementary layer to an overall lighting control system for the best possible results. Lighting modes can also be customized to automatically change on global scenes or astronomical calendars. These settings automatically configure the lighting of a room based on the sun’s position. Thus, shades on one side of the house may be lowered only as needed based on the amount of sunlight coming in a room. Moderately opaque solar shades can also be installed to protect your interiors from harmful UV rays while making a great view such as a garden, mountainside or ocean readily accessible. Even the physical install of unassuming controls and motorized shades can be custom-fit to seamlessly blend in with your décor. Make sure to partner with a custom integrator who has experience with camouflaging technology. A professional can keep unattractive cornice boxes or valances out of sight with a variety of recessed options. 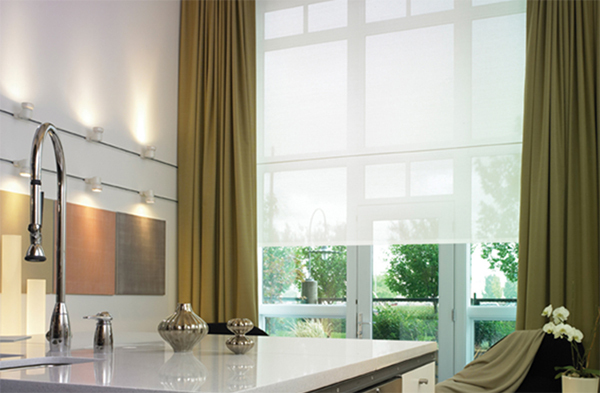 Wireless and battery-operated shades can even be installed where wires cannot be pulled or mounted on swinging doors. Make sure they partner with industry leaders, like Savant and Lutron, for the absolute best and most reliable solutions. The convenience of easy-to-use lighting and shade controls can also help simplify what used to be complex configurations. Automatic lighting paired with home automation controls can include occupancy censors that trigger various lighting scenes based on the time of day and vacation timers that help keep your home safe when you’re away. Even outdoor lighting scenes can be synchronized to an astronomical clock! Want your immaculate interior design and customized lighting to put the spotlight on your individual tastes? Call Rich AV Design today! We can help integrate lighting and shading control into your home. Whether throwing a party in Fairfield County or winding down and kicking back in Greenwich, from Stamford to New Canaan to New York City and beyond, custom lighting allows you to make changes from one reliable and familiar interface, to adjust natural and artificial light, and create the atmosphere you desire.